by the 23th of February 2018 to take advantage of the tax year end. Redemptions into a Tax Free Investment Account will not be available from the 24th of February 2018 to the 28th February 2018 and will resume on the 1st of March 2018. Access to the Bidvest Premier lounges will only be granted for 2 hours prior to scheduled flight departure time for domestic lounges and 4 hours prior to scheduled flight departure time for international lounges. Should UCount Rewards members wish to enter the lounge earlier than the prescribed times, Bidvest Premier Lounge will be entitled to charge the UCount Rewards member early check-in fees upon arrival at the lounge. Why not treat yourself and your family to a well-deserved vacation with the UCount Rewards Travel Mall? Redeem your rewards points for flights, domestic and international packages , car hire , weekend breaks cruises and we’ll not only arrange a unique package just for you, we’ll also take care of all the necessary arrangements too! To view your balance visit the Standard Bank Mobile App or SMS 'Balance' to 45224. SMS costs R1. 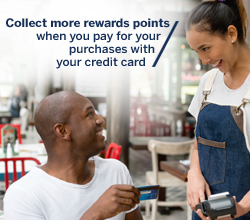 Who is eligible to join the UCount Rewards programme?